After design-concept meetings twice a week for three months, the generous help of offices throughout campus, and 12,000 frames of time-lapse footage documenting the whole process, three new murals were unveiled at a reception on Wednesday, Jan. 30, on the first floor of the Student Center. A mural of hands joined together by Chapman is titled “You Are Welcome Here.” McGee’s colorful, calligraphy-adorned mural with an image of a tea cup, a reference to scholarship teas held customarily at WSU, is titled “Two Dunks.” An astronaut mural by Acuña, with flags from many nations reflected in a spacesuit’s visor, is called “Nuestra Luna” which translates to “Our Moon” in Spanish. 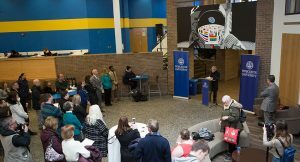 McGee’s artwork emphasizes Worcester State’s history as a public institution of accessibility and service, an institution that has evolved to serve and to be enriched by its ever more diverse students, staff, and faculty, he said. Chapman’s mural humorously embraces the unity and rightness of an oft-times strong and assertive individuality, and Acuña’s reminds us we are many nations, cultures, and individuals in a precious planetary home. One reason this project came about was due to President Maloney’s call to the entire campus to play a role in making Worcester State a more welcoming and inclusive place. The mural project is linked to the Five Points of Action he laid out a few years ago and to a campus committee’s recommendation to have more visual representations of inclusion on campus. An important impetus was Maloney’s commitment to listening to and acting upon student feedback from a campus climate survey done last academic year. 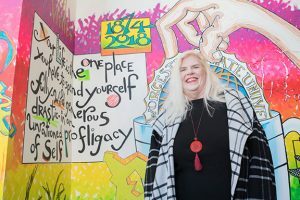 Director of Marketing Sarah McMaster added her interest in campus beautification to the concept and came up with the idea to have students paint murals somewhere on campus. Hachey’s involvement illustrates one of the three key messages the project aimed to highlight, namely that Worcester State has engaged faculty. 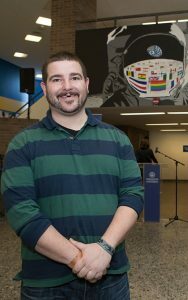 “That was evidenced by Michael Hachey’s willingness to run an independent study to oversee the student artists and the many, many hours they put in together as a team reviewing concepts, working on techniques, and preparing for the actual installation, as well as more administrative tasks like correspondence,” McMaster said. Another key mural-project message is that the university has a vibrant, thriving campus. 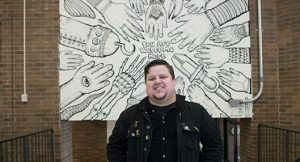 “This project supports this key message by adding student-led creative work in the form of these three murals to all our students’ and visitors’ experiences in the Student Center, a hub of campus activity and a student-centric building meant for student life to thrive,” McMaster said. 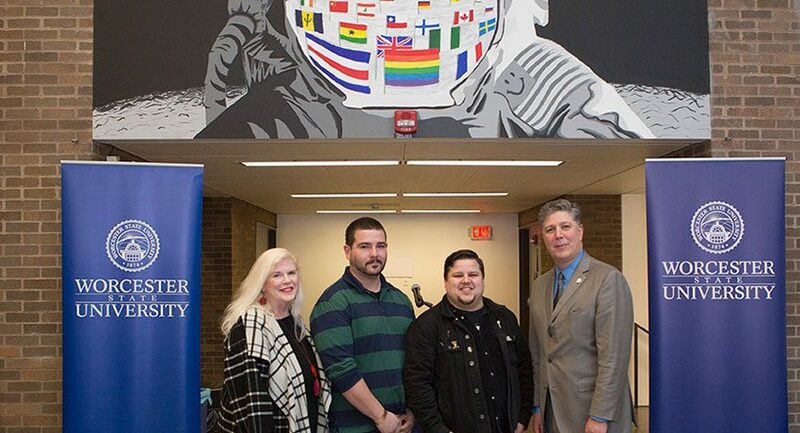 A third, and perhaps the most significant, message that the murals highlight, is that Worcester State has a diverse student body that enriches the campus community through their experiences and perspectives. 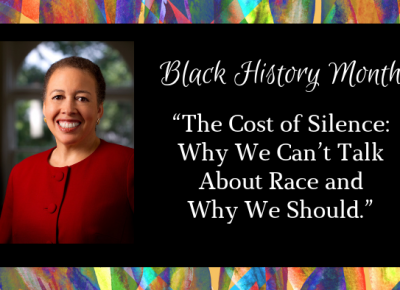 Dr. Beverly Daniel Tatum, a nationally noted scholar, author and race relations expert, will be the featured speaker for African American Read-in Day at 10:30 a.m. Feb. 6 in the May Street Building. Dr. Tatum, president emerita of Spelman College, is a clinical psychologist widely known for her expertise on race relations and as a thoughtful leader in higher education. The topic of Dr. . . .